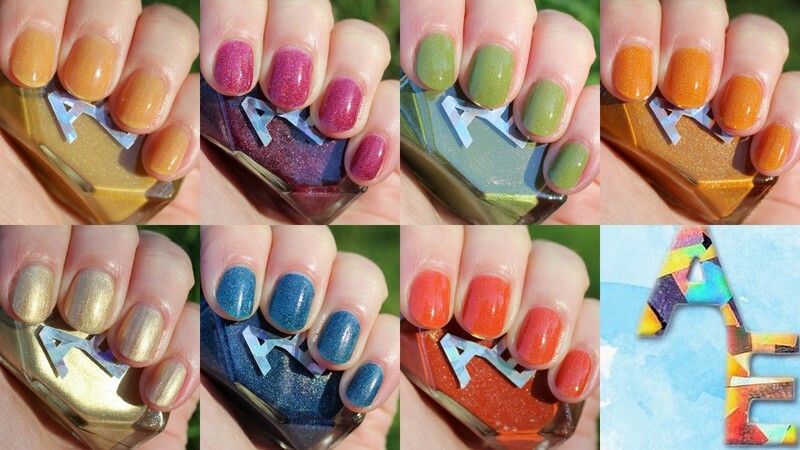 Today I have the Harvest Colors Fall collection from Alter Ego to show you! This is essentially a collection packed with the most autumnal colours ever, in a mix of finishes. I'll be sharing a discount code at the end of the post as well as all the release and pricing information you'll need but let's get on to the swatches! I Can See Your Halo is a slightly metallic gold holo. This one is pretty unique in my collection. I like how it sort of glows and shifts. I used 3 coats and no topcoat. Don't Pesto Me is a rich green holo. The holo is more subdued in this one. The colour is very saturated. I used 3 coats, no topcoat. Orange You Glad It's Fall is a vibrant orange holo. This one is stunning. It is bright, rich and perfect for autumn! I used 3 coats, no topcoat. Sass Squash is a mustardy yellow holographic crelly. This is another one which is unique in my collection. I used 3 coats for opacity, no topcoat. Moonless Night is a rich blue holo. I will warn that this one stained my nails slightly after only swatching so you will definitely want to use a basecoat! I used 2 coats. Tin Roof Rusted is a rusty red/orange holo. Exactly the kind of colour I love for autumn. I used 2 coats, no topcoat. Pour Me A Glass is a raspberry/burgundy holo. This one pulls a brighter pink in sunlight and more subdued burgundy colour in the shade. I used 3 coats, no topcoat. The Harvest Colors collection retails in full size (17 ml) for $9.50 each with $1 discount for the set of 7 for $51 and in mini size (8.5 ml) for $4.75 each with 0.75 discount for the set at $28. Thank you for your detailed review! All your manis and photos are stunning!